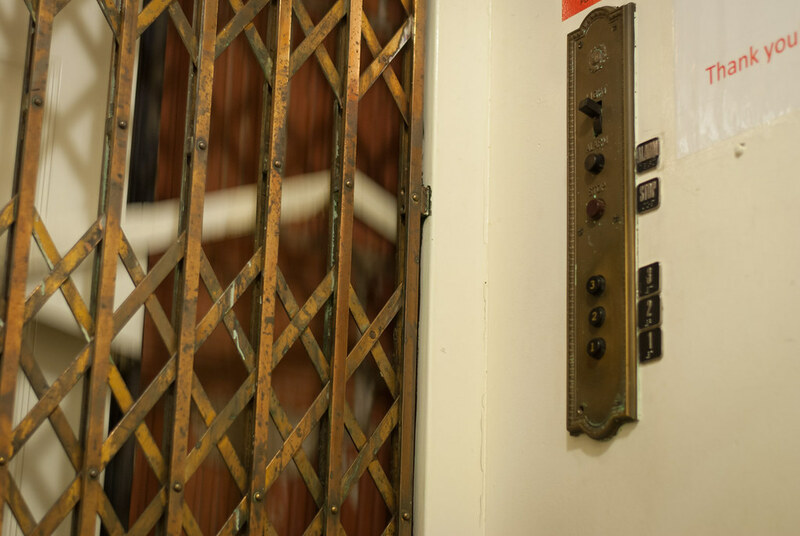 I’ve often thought about how I could capture a bit of the essence of this elevator with my 50mm lens, but one problem its that the field of view is so narrow its usefulness is severely hampered in small spaces like a six-by-five-foot lift. I’ve taken a few snapshots of the mechanical buttons, but that never seemed to do justice to the, um…essence of the elevator. A few weeks ago it finally hit me: why not try a shot while it’s actually moving? I shot this in the morning before anyone else was in my building, and rode it from first to third floor a few times while snapping a lot of pics at f/1.8, 1/20 second, ISO 200. With no tripod I had to shoot this handheld, so of several dozen shots only two or three were clean enough to clearly show the buttons and demarkations on the side. I have since thought about going back and re-shooting it with a tripod but I’m pleased with the photo itself and would rather try other shots based on what I learned here than go back and re-create something similar just to get it a tiny bit more sharp. My goal in this pic was to not only show the buttons (which give a sense of how old this thing is) but the gate and the passing innards of the building itself. It’s just not something you see everyday, and while a static shot would have likely sufficed I thought it was cool to get a sense of motion to help the viewer feel as though he or she is actually riding this rickety rush bucket. I mean, classy work of engineering. Had court this morning and didn’t get to see your post as early in the morning as I usually do. Interesting work today! If you shot this without a tripod, then having a shutter speed of 1/20 tells me that you really worked hard to keep the camera still and not to have any blur (other than the parts of the building on the other side of the gate passing by). They say a Rule of Thumb is no shutter speed slower than the 1 over the length of the lens without a tripod. 1/50th in this case. I assume that you focused on the gate itself and not the building behind it. I like the inclusion of the old buttons. I don’t like the plastic covered sign. I do like you taking the time to post this — Have a blessed day! I hope court went well this morning! In the mid-1970s I had a job working an elevator such as this (we call it a lift in the UK) – an excellent way to meet a wide varity of people. They needed someone to operate it specifically to ensure that the lift doidn’t get stranded with the doors open.